No joke! I seriously laughed out loud when I was reading his most recent tirade. I'm like dude, you're essentially complaining that the liberal blogs are doing what you do. The funniest thing is his comments. "Bloggers are right to dig for more information about his birth, such as was he adopted by his Indonesian father. Why do classmates in Indonesia know him by a different name than Obama? Why do classmates say other things about the religion he practiced but now denies? Why are dates for a marriage and divorce given for his parents and then his own wife says his mother was single when he was born?". Where was Barack Obama on 9-11? LOL. Seriously, how pathetic. His venom for Democrats used to at least be strong. Now it's so weak it could be pushed over like a paper cup. It used to be funny, now it's just pathetic. 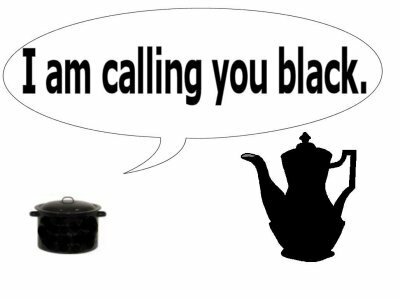 The pot needs to be shouts names, gossip and racial epithets to truly picture Gary Welch. His column on irresponsible blogs spreading gossip about the attorney general of Alabama is the exact same thing he has done for years. It used to be the Carsons and Bart Peterson. Now it is Obama. Unfounded rumors and gossip is posted on a daily basis. I feel truly sorry for him.